Any recent or planned change in your job status should give you pause when it comes to buying a home. If you just started a new job, you might not have the income stability lenders like to see when deciding whether or not to approve a mortgage applicant. If there was a gap in your income or your salary significantly changed, it’s possible you won’t qualify for a home loan for at least a few months. Similarly, if you’re planning to change jobs in the next year or two, buying a home might not make sense. Homeownership is a big commitment. A new job that requires you to move means that you have to try to sell the house (or rent it out) before you start building equity. Buying a home makes more sense when you have a comfortable job situation and you’re planning to stay put for a while. When you get a home loan, most of your initial payments go toward interest. That’s because when you first start repaying your mortgage, your loan amount is the largest it will be — you’re charged interest on nearly the full price of your home. But after 10 or 15 years of repayment, you’ve paid a lot of the loan down; now you’re charged interest on a much smaller principal balance. In turn, a bigger percentage of your monthly payment can go towards the loan’s principle rather than interest. If you don’t stay in your home very long, you won’t have time to build up the equity that comes with paying down the principal. 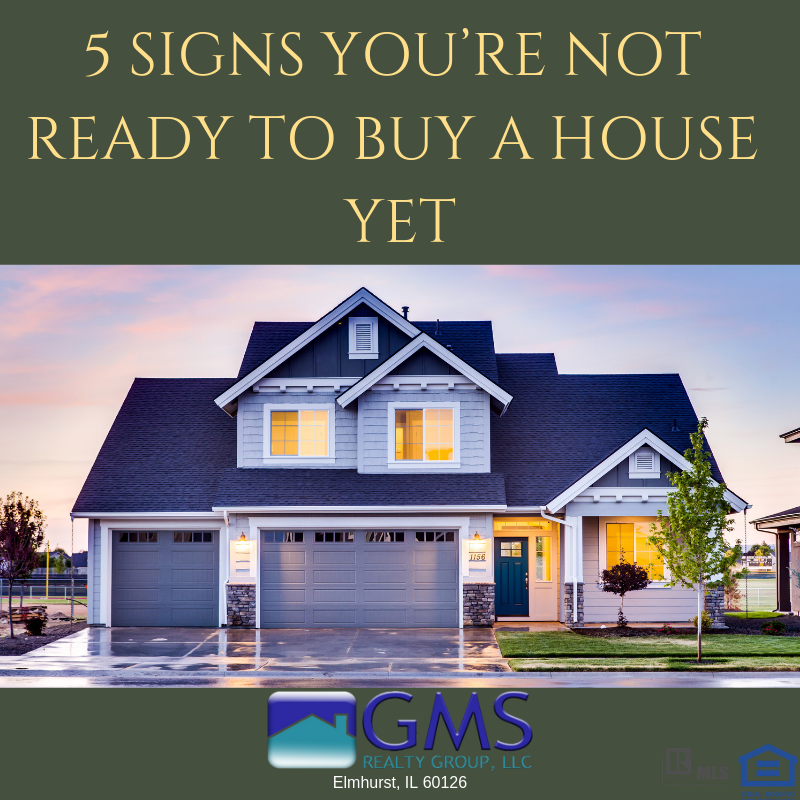 The general rule of thumb is that if you aren’t going to keep the home for at least five to seven years, you shouldn’t buy it. It can make sense to buy if you have a plan to stay in the home for a few years and then rent it out. However, if you don’t have a good five-year plan for what you are going to do with your money, it probably doesn’t make sense to buy right now. Figure out what you want to do with your time, energy, and money. If you have a spouse or partner, discuss the future with them. Once you figure out what the next five years hold, you can decide if buying a home fits into the picture. One way to reduce the amount of mortgage debt you owe and how much you pay in interest over time is to make a sizable down payment. These days, a huge down payment isn’t required to buy a home. There are lenders who will accept five or 10 percent down. If you qualify for an FHA home loan, you can pay as little as 3.5 percent down. However, saving up for a down payment is a smart move. The more you can pay up front, the less interest you’ll have to pay over time. Additionally, if you save up a 20 percent down payment, you won’t have to pay private mortgage insurance (PMI), which can be pricey. Any down payment can help, though. Putting as much down as you can now, even if it isn’t 20 percent, means you pay PMI for a shorter period of time. Once you’re responsible for a home, you have to be prepared for expensesbeyond the mortgage payment. There are fixed costs such as property taxes, HOA fees, and insurance. But you also have to be prepared for unexpected costs such as replacing the water heater or repairing a leaky roof. Remember, there’s no landlord to call about maintenance issues now – you’re responsible for it all. Saving up an emergency fund can help you prepare for those extra costs. Although there are a few theories about how much should be in your emergency fund, three to six months’ worth of living expenses is a good number to shoot for. When you have a lot of debt, buying a home might not be the best option. First, those obligations can put your ability to pay your mortgage at risk. Some lenders may be willing to let you buy a home when you have a relatively high debt-to-income ratio, but that doesn’t mean you should accept a mortgage. If you have to stretch to afford your mortgage payments along with your credit card, car loan, and other payments, you run the risk of falling behind — and possibly losing the house. But even if you can comfortably afford all your expenses, applying for a mortgage might be a futile effort anyway. So pay down your credit card debt before you apply for a mortgage. In fact, keep the total debt-to-income at 36 percent (including the potential mortgage payment) for the best odds of being approved. Also, aim for a mortgage payment of no more than 28 percent of your monthly income. When you stick to the 28/36 qualifying ratio, you’re more likely to be able to afford the home and actually qualify for a loan. Ultimately, you’re the only one who knows whether or not you’re ready to buy a home now or wait for a better time. Think about your current situation as well as what you expect to happen in the next five to seven years. Be honest with yourself. There’s no shame in waiting to a buy a home if now isn’t the right time for you. After all, it’s probably the biggest purchase you’ll ever make.